The attempt to bridge our country’s great divide has begun with the first meeting in the White House between President Obama and his one-time birther tormentor, President-elect Trump. It’s like we’re in some disconnected time and place after that hate-filled scorched earth campaign of the last 19 months. 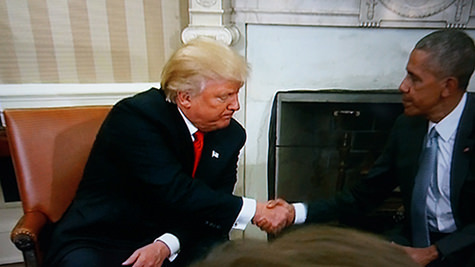 And now, we must replace all those memories with this image: Obama and Trump actually shaking hands in the Oval Office. You might call that leading by example, at least for one-half of the nation. And then it was Trump’s turn to address the other half. But Trump wasn’t arrogant and full of himself. 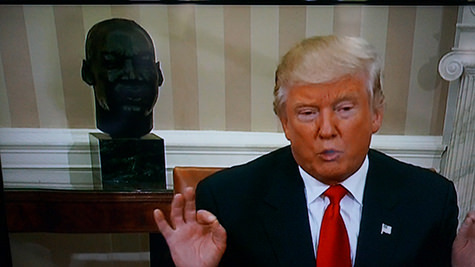 Surprisingly, Trump was quiet, respectful, seemingly humbled by his circumstances sitting with a bust of Martin Luther King, Jr. over his shoulder, while sitting next to President Obama. We’ll see how his red state voters take all that. Until then, I say, “Welcome to 1963.” The year before the Civil Rights Act. Two years before its corollary, the Voting Rights Act, as well as the law that brought most Asian Americans here, the breakthrough Immigration and Nationality Act of 1965 that eliminated racist quotas. 1963 is before all that, when the fight was raw. Remember that era to stay energized in these Trump times. Aside from the feel-good photo ops, politics will feel a little bumpy in this post-post-racial America. The loud, but mostly peaceful, protests around the country in Oakland, New York, Philadelphia, and other cities Wednesday night were just an extension of one half of the electorate’s pain. But it all began Tuesday with the gut punch from the nation’s other half. Election Night BluesOn that night, I was waiting for Pennsylvania, Wisconsin, and Michigan to all turn blue. They never did. And by Wednesday, we were bathed in red, and not from the shards of any break in a glass ceiling. When the least qualified, least experienced candidate for the job can become president of the United States, well, that’s how effective affirmative action for whites can be. That’s the election of political neophyte Donald J. Trump, the tycoon turned showman, turned leader of his own brand of democracy. Build a wall? Ban Muslims? Deport millions? That and save jobs, fix our roads and infrastructure, all while cutting taxes. It’s the Trumpian fantasy fueled by an unconventionally candid hate rhetoric, complete with endorsements from the KKK and David Duke. The difference in this election appears to be the angry white voters from rural areas in the Rust Belt. They were the ones running up the red in the blue states. They’re the ones yearning for the rollback to the past. They were the real November Surprise. Pollsters, the political class, and the media had simply stopped talking to them, not paying attention to them as if they were invisible. These were the whites who felt left behind by the growing tech economy, overshadowed by the demographic steamroller that is diversity. They felt angry and taken for granted. Asian Americans know how that feels. Mainstream pollsters, politicos, and media folks still ignore us. Despite our numbers growing to more than 20 million, we’re still rarely taken seriously. How many times did you watch the election night tallies and wonder how we were reflected in the vote count? Most exit polls don’t get enough of an Asian American sample to even acknowledge our existence. Only in unique exit polls that target Asian Americans specifically, in language, and in large enough samples, do we see reliable data. You need an effort like AALDEF’s election day exit poll, which included 950 attorneys, law students and volunteers in 64 cities and 14 states conducting nonpartisan polls of 14,400 Asian American voters in English and 12 languages. In two of the “Blue Wall” states, Pennsylvania’s Asian American vote was Clinton over Trump, 87-12 percent; Michigan’s Asian Americans voted for Clinton over Trump 91-7 percent. The overwhelming sentiment: Hillary Clinton was Asian America’s choice for president. Asian Americans are still such a small part of the electorate, only in coalition with others do we make a difference. In 2008 and 2012, it was known as the “Obama Coalition,” primarily voters of color: African Americans, Latinos, and Asians. But the numbers for this group were much lower for Clinton in 2016 than for Obama in 2012, according to the more general mainstream national exit polls. Blacks were 93 percent for Obama in 2012. Just 88 percent for Clinton in 2016. Latinos were 71 percent for Obama in 2012. Just 65 percent for Clinton in 2016. Asian Americans, according to CNN exit polls, gave much lower support for Clinton compared to Obama, an 8-point drop off from 2012, 73 percent to 65 percent. I’d still quibble with the accuracy of mainstream pollsters, given the sampling methods of Asian Americans, but generally, CNN’s numbers suggest that peop le of color just didn’t turn out for Clinton as they did for Obama. The coalition didn’t vote. Too many voters stayed home. And while Trump didn’t win the diversity vote, he did slightly better than Romney in 2012. Enough to turn those blue states red. I found it all disheartening. Even though the vast majority of what I call the “diversity vote” still backed Clinton, it doesn’t have the impact of the “Obama Coalition” of 2012 unless it’s near unanimous. To be effective, anything short of a monolithic vote doesn’t seem impactful enough. As many more of us peel off toward independence, our political power is diminished. We’re assimilated and vote outside of our group. That wasn’t a problem for the white voters that roared loudly on Tuesday. Trump’s hate rhetoric did better than he could have imagined. It attracted all the angry whites he wanted without excessively alienating minorities. It also showed that coalition of angry “change” voters for Trump wasn’t exclusively white. It also had a few Asian Americans, especially among Filipinos, who had a preference for Trump. “I am extremely happy,” Dr. Roy Flores, a Republican in Ohio, told me the day after T-Day. I’ve been tracking Flores throughout the campaign, and he’s literally the flip side of the 2016 Rust Belt voter–not a down and out left-behind white male, He’s a well-to do immigrant, a medical doctor, Christian, gun-owning, small government, anti-tax fiscal conservative. He’s part of that half of the country. But he’s still one of us–an Asian American. And that’s how we should approach these Trump years. We’re divided. But we should still be talking to each other. We should also take our cue both from Secretary Clinton and from President Obama. Clinton seemed like she was at her own funeral at her post-election event at the New Yorker hotel. But now everyone still expects Trump to take the baton and start running backwards. That made the meeting on Thursday between the two of them slightly awkward. Would Trump show up with an eraser or rolls of Wite-Out? Would Obama have his birth certificate handy? 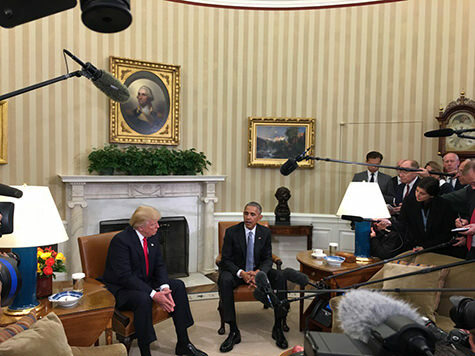 Both Obama and Trump seemed more genuinely civil, as if to set an example for the nation. This doesn’t have to be four years of a domestic cold war. But we should be prepared to engage vigorously, and even protest peacefully. The fights and disagreements are sure to come. There will be plenty of them, over DACA/DAPA, mass deportations, Muslim bans, attempts to repeal Obamacare, pack the Supreme Court, and the continuing attempts to disenfranchise voters. The rollback to 1963 is coming. The loyal opposition must be on alert. Don’t let one loss on Tuesday get you down. If we remember the spirit of the era that paved the way to landmark civil rights victories of the sixties, America will find a way to roll forward through the Trump years.